North Fork Valley Creative Coalition is proud to announce a call for entries for our 2018 art auction at our Celebrate the Fork Dinner Benefit. This Farm-to-Table dinner is an opportunity to celebrate our local talent by auctioning off your 2-D work for visitors and locals in an intimate setting. Artists must be current members of the North Fork Valley Creative Coalition. Artists may submit up to three images of actual work available for auction. Six to Eight 2-D works will be selected for the live art auction that best showcase the wide range of talent our valley has to offer. Please submit your best work with photos that represent the work clearly. Pieces will be selected by the Art+Ag Tour Committee. All decisions will be final. Selected artists will receive notification by August 8th, 2018. Artwork must be dropped off on August 29th, location information to follow. All work must be original, no prints (with the exception of photography) and must be show ready as winners will be taking the art home directly from the auction. Artist to specify minimum starting bid. Artist will receive 60% of final auction price. 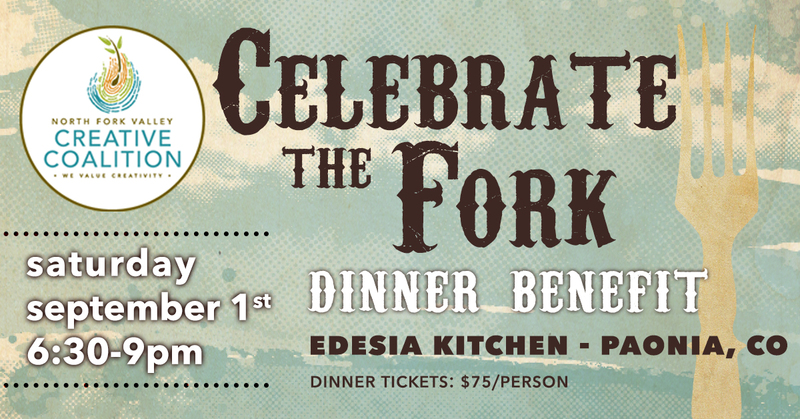 BUY CELEBRATE THE FORK DINNER TICKETS NOW! Liability: All artwork will be handled with reasonable care. However, accidents and events out of our control may occur. Therefore neither the Art+Ag Tour Committee nor the NFVCC will be responsible for or reimburse for any theft, loss or damage. Artists are encouraged to maintain their own insurance covering losses or damage that may occur during transport and display of their work. Agreement: By submission of an entry, artist agrees to all conditions stated herein: Waives any claim for loss or damage against the NFVCC and the Art+Ag Tour Committee. Agrees that the NFVCC and the Art+Ag Tour Committee have the right to make final decisions as to marketing and display of artwork. Authorizes the NFVCC and the Art+Ag Tour Committee to use any image submitted for purposes of advertising and promotion. Agrees to deliver selected artwork at designated time and location (more information to follow). Agrees to submit only works that are original. All works must remain on display through entire auction. Agrees that any unsold works will be picked up by September 5th (location info to follow). Agrees that the NFVCC will manage all sales and retain 40% of final auction price.